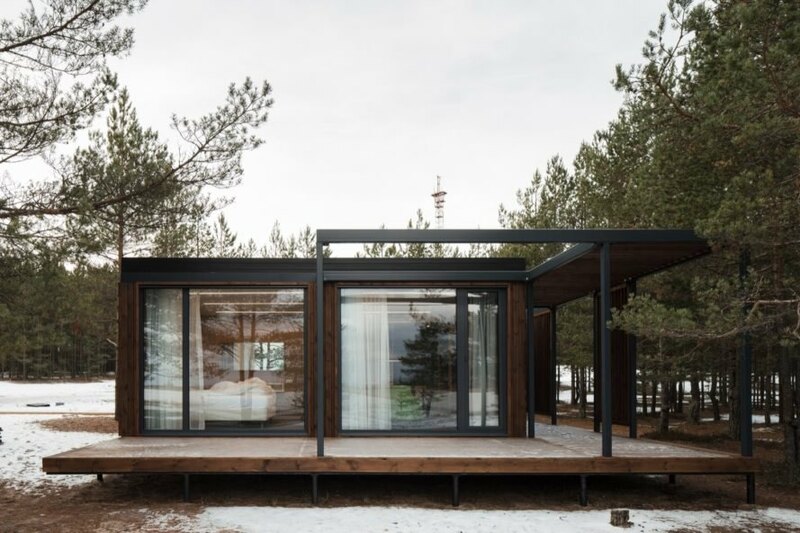 St. Petersburg-based architecture firm Rhizome group designed and built Tochka na Karte Hotel, a prefabricated structure crafted to embrace the outdoors. Located in the northern Russian town of Priozersk in Leningrad Oblast, the hotel complex is a sleek and modern getaway nestled among mature pine trees. The use of modular technology has helped reduce construction waste and minimize site impact, including the preservation of existing trees. 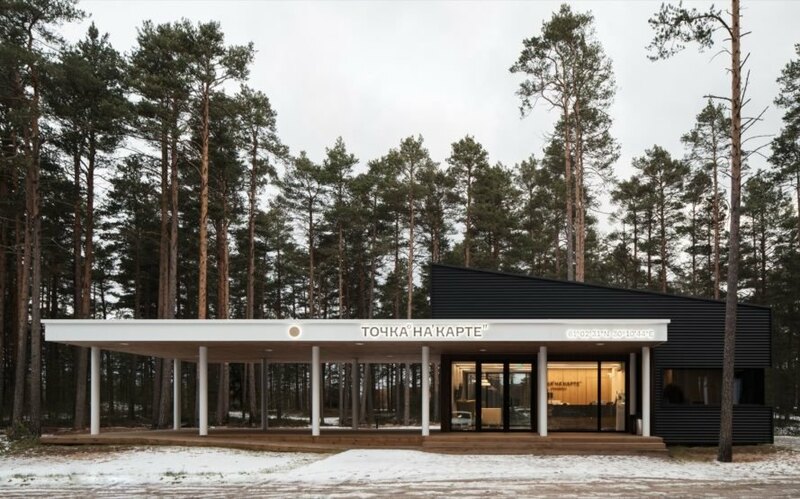 Located just a two-hour drive north of St. Petersburg, the Tochka na Karte Hotel (Russian for ‘a point on the map’) is set on the shore of Lake Ladoga on the border of the Republic of Karelia. Due to its proximity to St. Petersburg, historical points of interest and abundance of pristine nature, the area has long served as a major tourist destination for Russians and foreigners alike. The hotel taps into the region’s natural beauty by using floor-to-ceiling glazing to frame outdoor views from every room, thus blurring the line between indoors and out. The prefabricated building comprises three two-story blocks with 32 standard rooms, detached suites (built of two modules) and a reception building (assembled from three modules and some prefabricated elements). The modules, which measure 3.5 meters by 7 meters, were constructed in a factory and then assembled on site. Stairways and terraces connect the modular blocks. The facade was built of timber and dark metal to tie the building into the wooded landscape. 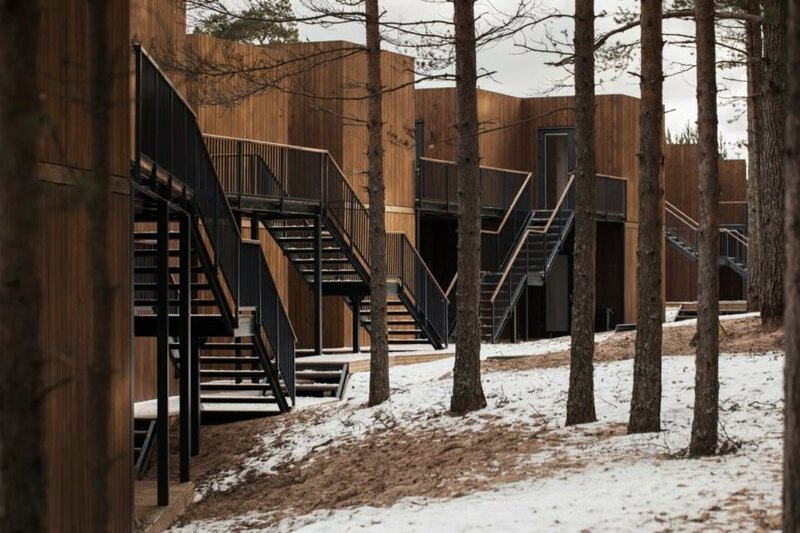 To further blend the hotel into its pine forest backdrop, the structures were “dispersed” among existing mature pines near where the Vuoski River meets Lake Ladoga. The hotel overlooks views of the lake. The facade blends into the landscape with its timber and metal facade. The reception building was assembled from three modules and some prefabricated elements. Stairways and terraces connect the structures. The rooms are fitted with floor-to-ceiling glazing. A look at a section of the hotel.